Intel’s new series of Coffee Lake CPUs has been a massive hit, with the Intel Core i7-8700K processor becoming especially popular among gamers who desire the most powerful hardware they can get their hands on. However, all Coffee Lake CPUs come with one huge caveat: they are only compatible with the new 300-series chipsets. If you’re still using a Skylake or Kaby Lake CPU and would like to upgrade to Coffee Lake, you must first pick a compatible motherboard. To help you out, we’ve selected top 7 best 300-series motherboards that are currently available. All motherboards on this list are fully compatible with the Intel Core i7-8700K processor and have been praised by reviewers and gamers alike. Coming up as our number one contender, we have the MSI MAG Z390 Tomahawk motherboard. This one will work with most 8th Generation and 9th Generation Intel Core processors, including the Intel Core i7-8700k CPU. The i7-8700k isn’t going to be the most powerful in the Intel Core lineup of processors, but the Z390 Tomahawk motherboard is going to enable you to bring all that is possible out of it. The motherboard knows how to use your chip most efficiently, and gives you plenty of overclocking capabilities for it as well. The Tomahawk does support overclocking through Intel Turbo Boost — you’ll be limited to what the CPU can max out as, though there are some adjustments that can give you free reign over your overclocking capabilities. The motherboard itself was built for long lasting performance; however, MSI doesn’t seem to have many proprietary technologies built in that keep you safe from overheating and such, which puts more responsibility on you, the user, to watch how far you can take things. As you might imagine, MSI’s Z390 Tomahawk supports that latest generation in memory — DDR4 RAM. There’s support for up to a whole 32GB of memory in four slots. There are two “Turbo” M.2 slots, and this one does come with a pre-installed IO shield. MSI does say this one is built for gaming; however, as far as motherboards designed for gaming go, the Tomahawk probably sits in the mid-range area as far as performance goes. If you’re looking for something a little more on the tougher spectrum, the ASUS TUF-Z390 Pro will be right up your alley. Rated well for gaming purposes, this motherboard will last you a long time because of it being a “TUF.” The motherboard is built with military grade protection, which gives this motherboard long-lasting durability. As you might imagine, this Z390-based motherboard is another one that sits on the LGA 1151 socket, and as such, works with the majority of the 8th and 9th Generation Intel Core processors out there today. The i5-9600k is, of course, one of those. And as many are looking for, you have a great IO here — there are plenty of USB 3.1 ports, various display options, and there’s even a Gigabit LAN port for a fast Internet connection. This motherboard supports overclocking through Intel Turbo Boost, and there’s a number of different proprietary technologies inside to help you with overclocking. Those technologies are are Gamer’s Guardian with Safe Slot, and another one called Fan Xpert 4. Both of these provide hardware-level safety features, but the Fan Xpert 4, kicks in to help keep components cool during overclocking, preserving hardware for long-term use. The ASUS TUF-Z390 actually has an integrated audio chip, which brings you premium audio capabilities without having to take up precious room with a sound card. The ASUS ROG Strix Z370-E Gaming is an ATX motherboard that stands out with its aggressively shaped coolers and customizable LEDs. The motherboard supports the Aura Sync RGB LED lighting system from ASUS, offering full RGB lighting control with a variety of functional presets for the built-in RGB LEDs as well as strips connected to the onboard RGB headers. Of course, this premium motherboard has much more than good looks going for it. For starters, its T-Topology layout ensures time-aligned signaling by balancing trace lengths between memory slots and allows for memory speeds of DDR4-4000 with all slots populated. The ASUS ROG Strix Z370-E Gaming comes with an onboard 802.11ac Wi-Fi with 2×2 dual-band 2.4/5GHz antennas, offering transfer speeds up to 867 Mbps. With dual PCIe 3.0 x4 M.2 slots, you can connect two NVMe SSDs in RAID configuration and enjoy data transfer speeds of up to 32 Gbps. Overclocking with the ASUS ROG Strix Z370-E Gaming is a matter of a single click thanks to ASUS 5-Way Optimization technology, which dynamically optimizes essential aspects of your system and provides overclocking and cooling profiles that are tailored for your rig. 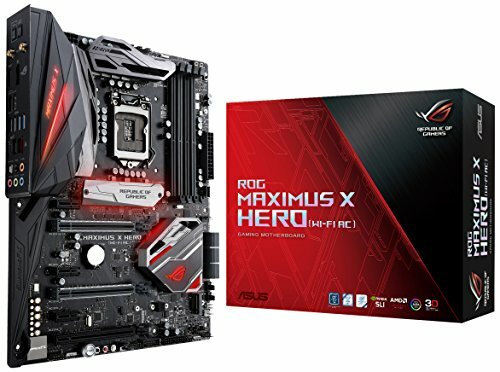 The ASUS ROG Maximus X Hero shares many similarities with the ASUS ROG Strix Z370-E Gaming, but it features an improved audio chipset and support for faster memory. Whereas the ASUS ROG Strix Z370-E Gaming allows for memory speeds of DDR4-4000 with all slots populated, the ASUS ROG Maximus X Hero can reach memory speeds of DDR4-4133. Thanks to the presence of SupremeFX audio technology, the ASUS ROG Maximus X Hero is truly an audiophile’s motherboard. It can deliver 113 dB signal-to-noise ratio and relies on high-end Japanese components to produce a warmer, natural sound with exceptional clarity. While sound quality may not be every gamer’s top priority, it takes just a few hours with the ASUS ROG Maximus X Hero to realize that it should be. This motherboard is also exceptionally DIY-friendly and recommendable even to those who have never put together a PC from scratch before. Both memory modules and the graphics card can be removed with just one hand thanks to one-sided clips, and all front-panel cables are taken care of by a single connector. 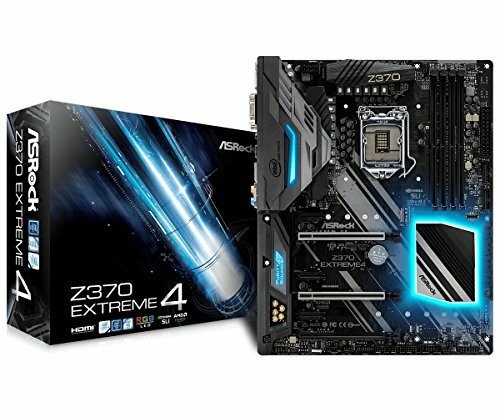 The ASRock Z370 Extreme4 is an exceptionally capable gaming motherboard with a surprisingly low price. It has been designed to power immersive VR and gaming experiences, and it features a host of cutting-edge technologies to deliver the highest performance possible. For example, ASRock Hyper DDR4 technology can automatically optimize DDR4 memory module to provide a noticeable performance boost when playing games but also when browsing the web or doing other common tasks. By combining audiophile-grade hardware components and cutting-edge software audio solutions, the ASRock Z370 Extreme4 is able to deliver fantastic audio performance and offer 120 dB signal-to-noise ratio. Because the ASRock Z370 Extreme4 has two steel-reinforced PCI-E slots, you can install a powerful graphics card with a heavy custom cooler without any risk of the slot breaking under the card’s weight. The same attention to detail can be found everywhere on the motherboard, and we can’t wait what ASRock’s future products will look like. GIGABYTE has been in the game for long enough to develop a deep understanding of what gamers want. 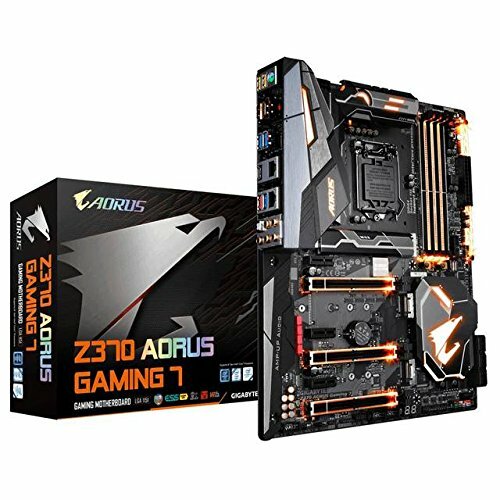 The GIGABYTE Z370 AORUS Gaming 7 motherboard is designed for gaming enthusiasts who want only the best for their gaming machine. It features three M.2 connectors to achieve data transfer speeds of up to 32 Gbps and Thermal Guard technology to prevent throttling and bottlenecks from M.2 devices by dissipating heat before it becomes an issue. The GIGABYTE Z370 AORUS Gaming 7 motherboard supports up to 300 LEDs thanks to its RGB Fusion lighting system, which offers users the option to conveniently control and customize onboard RGB and external light strips to adapt their PC to represent their lifestyle. To keep powerful gaming rigs running at an optimal temperature, the GIGABYTE Z370 AORUS Gaming 7 motherboard is equipped with the Smart Fan 5 system. With it, users can take advantage of nine temperature sensors, eight fan/water pump connectors, and an intuitive user interface for fan control. 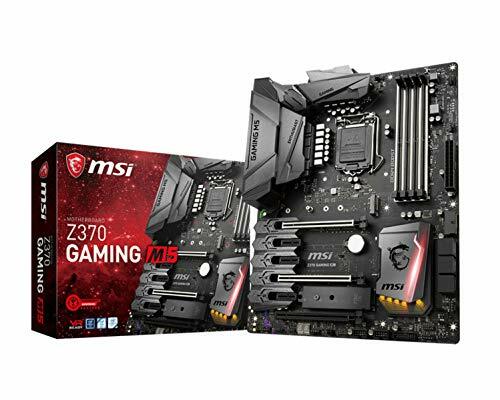 The MSI Z370 GAMING M5 is designed to support next-generation gaming experiences, featuring an advanced cooling system, audiophile-grade sound quality, high overclockability. The brain of the MSI Z370 GAMING M5 is something MSI calls OC Engine 2. The purpose of OC Engine 2 is to optimize every aspect of the motherboard for maximum performance and do so in real-time. Thanks to OC Engine 2, you can stop worrying about your settings and start enjoying your gaming rig the way it’s meant to be enjoyed. 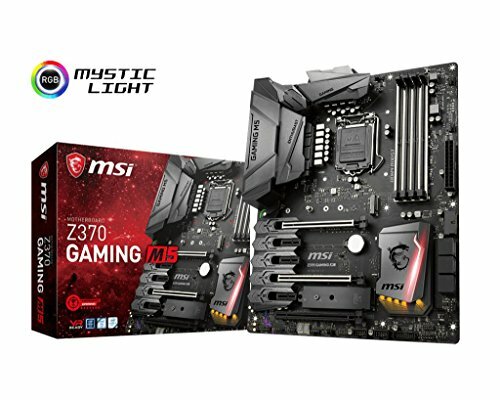 The look of the MSI Z370 GAMING M5 motherboard can be customized with the MSI Mystic Light utility, which allows you to personalize your computer with 16.8 million colors and 17 mesmerizing effects. You can even create your own unique modifications with 3D-printable parts offered by MSI MOD HUB to really make the MSI Z370 GAMING M5 motherboard yours. As you can see, there are some awesome choices in terms of motherboards available. Whether you’re looking for something that can help you with gaming, or something that can simply get a work machine up and running, any one of these motherboards will help you out. 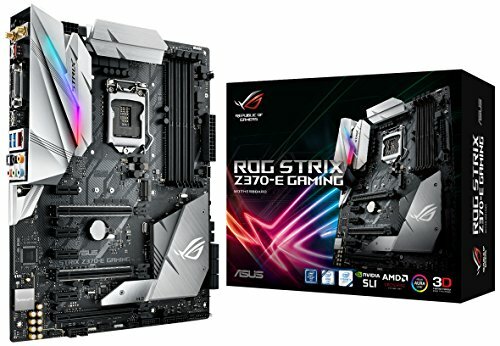 MSI has some excellent options, and so does ASUS. What are you planning on picking up? Sound off in the comments section below!